Every day, Jaiden Woodbey drives to school here at St. John Bosco high school from his home in Fontana, California. The one-hour drive every morning is tough for the star football player and track-and-field standout, but represents the commitment and dedication Woodbey has as a Bosco Brave and member of the community. It’s not easy to be a 5-star recruit and one of the top defensive backs in his class, while in the process exemplifying what it means to be a Bosco Brave. Woodbey graces the campus every day as a role model for everyone. On and off the field, he’s a true 5-star recruit. Over his high school career at St. John Bosco, Woodbey has achieved many things on and off the field. He is widely considered to be the best defensive back in the 2018 class, with a full-ride scholarship to Ohio State University next year already in the works. Woodbey is an All-American Army Bowl commit for this year, and has been a clear-cut leader on Bosco’s defense for the last two seasons. “My parents have always been instilling it in me since I was little that [I’m going to be] one of the best athletes in my class. You will everything into existence, so it’s just persistence and hard work that makes everything go through,” said Woodbey about his success on the field as a football player. Off the field, Woodbey is a perfect representation of a Bosco man and member of the community. He works hard in class and is respectful and open to all of his peers on campus. That’s not something you’d normally expect from such a highly-touted recruit, but Woodbey goes the extra mile. Woodbey is well-liked and respected on the football team as well. As a leader on the team and somebody who has experienced a state championship, he is someone who many of the younger and newer players look up to. “Jaiden is a really good teammate, and an even better person off the field. He brings a lot of positivity to the secondary especially, and that helps keep us grounded and stay humble too,” said junior cornerback and top-recruit Chris Steele about Woodbey and his leadership. This just goes to show how much Woodbey is truly valued and appreciated by his teammates on the football team. Going into his senior season at Bosco, Woodbey wants to end his career academically and athletically on a high note. After such a successful career, Jaiden still strives for more. “Sports-wise coming into my senior year, this is my last ride so I got to make the best of it. Now what I’m focusing on academically is graduation,” said Woodbey on some of his senior year goals. Woodbey has high expectations for his football team this season, and expects nothing less than another run at state and national championships. Those numbers would definitely help the Braves chance of achieving their ultimate goal this year. Jaiden is headed to Ohio State next year to further his academic and athletic career. He believes that he really feels at home on campus, which made his decision to pick between 30 colleges easier. “I took my visit up there, and it was everything I ever wanted. This school was a little bit different than the other ones. My parents gave me the thumbs up, and I’m a Buckeye,” said Woodbey with a smile. Woodbey will graduate early from St. John Bosco, as he will enroll at Ohio State soon after he completes this semester. He expects to make an immediate and impactful contribution to the football team as soon as he arrives, and who would doubt him? Woodbey has his future goals in mind, and there is no stopping him on his way to achieving these goals. Who would blame him? With Woodbey’s work ethic and dedication, nothing is out of the question. The college experience is great and completely different from high school, especially for a star football player at a nationally-ranked powerhouse such as Ohio State. For Jaiden, it’s exciting, yet tough to leave. “It’s a bittersweet thing. 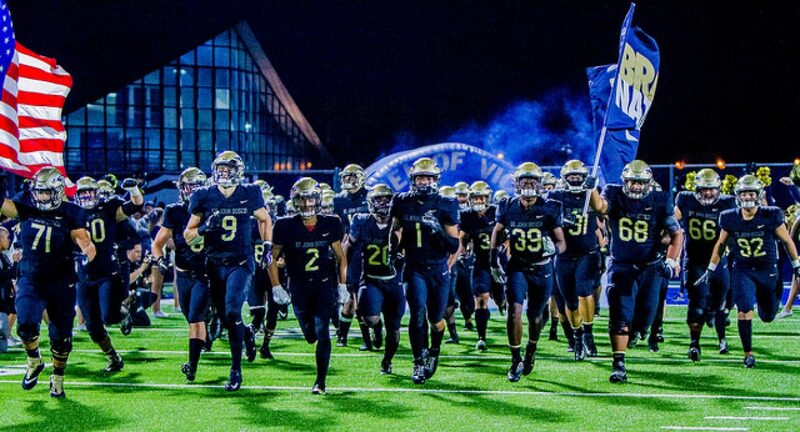 I’m glad high school’s over, but then again… these are my guys and I [will] miss playing with them every Friday,” said Woodbey on leaving Bosco for a new chapter at Ohio State. Bosco will miss Jaiden sincerely, on and off the field. Through his career here as a Brave, he has brought success and leadership in various ways. It only seems right that Jaiden Woodbey ends his career an legacy as a Brave with another state and national championship run, which is very likely to happen behind Woodbey and his defense this season. In the end, Woodbey has accomplished one of the most important things any Bosco student can do. He has shown what it means to be a Bosco Brave and has represented our school amazingly throughout his career. For these reasons, Jaiden Woodbey is our Brave of the Issue.